A classic line from This is Spin̈al Tap, the 1984 rockumentary / mockumentary about the world’s loudest band, British heavy metal group Spin̈al Tap. This Is Spinal Tap was directed by Rob Reiner and largely improvised by the main players Rob Reiner, Christopher Guest, Michael McKean, and Harry Shearer, (as documentary director Marty Di Bergi, and band members Nigel Tufnel, David St. Hubbins, and Derek Smalls). 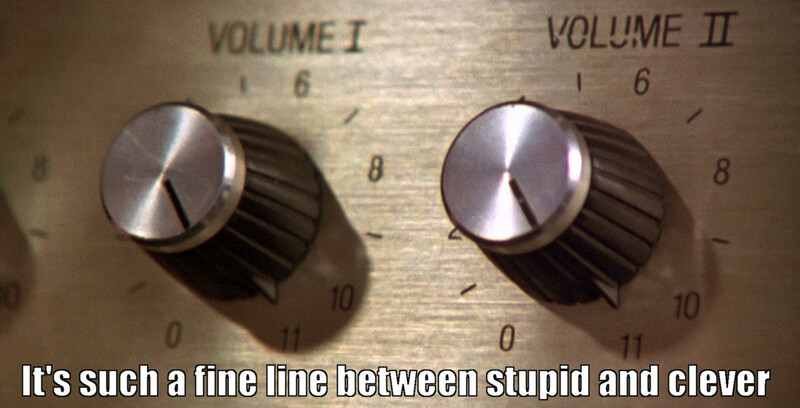 David St. Hubbins: It’s such a fine line between stupid and..
Nigel Tufnel: clever. It’s just that little turn-about..
Derek Smalls (? ): a reversal of roles. And here I’ve made it into a handy poster image, using a shot of the famous amplifer from This Is Spinal Tap which is louder than others, Nigel explains, because it can be turned up all the way to 11. Comment below, or by Twitter .